Lee County (pop 19,220), northeast of Sumter County, is one of 12 Lee counties in the U.S. – most of them in the Southeast. The one in Illinois was named for Richard Henry Lee. Interstate 20 runs through the middle of Lee County; the highway goes from Florence, S.C., west to Columbia, Atlanta, Birmingham, Shreveport, Dallas, and on to West Texas. 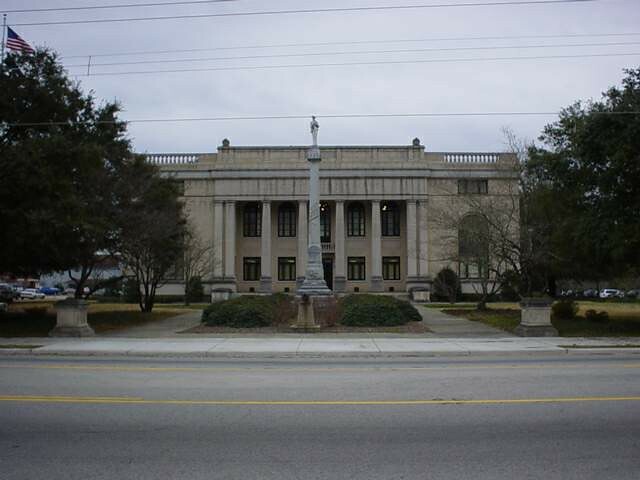 The county seat of Lee County is Bishopville (pop. 3,471). Lee County is an historically important area for cotton-growing, and Bishopville is the home of the South Carolina Cotton Museum. Bishopville is also the home of the Button King Museum, featuring a wide variety of items (clothing, musical instruments, a car) with buttons attached to them. The Pearl Fryar Topiary Garden is another attraction in Bishopville. Lee State Park is just east of Bishopville. Football great Felix Anthony “Doc” Blanchard (1924-2009) grew up partly in Bishopville. The Lizard Man of Scape Ore Swamp is reputed to live in Lee County. Seven feet tall and scaly.